Ekaterina Tulupova and Olesya Sitnikova, a designer and an architect, respectively, got to know each other when studied in Milan, and in Moscow they founded Arch.Predmet Interior Design Studio. Sitting in their new office, the owners of the studio provided InMyRoom with information on points of difference between education in Russia and in Italy and told about making the interior of a real town mansion. 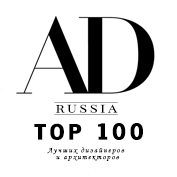 What is your estimate of the quality with regard to design education in Russia? Olesya: The education we received in Russia provided us with knowledge in the field of structures with engineering accuracy and drawing skills. But, unfortunately, the system in general is based on the achievements of the past, the things which were of vital importance 50−60 years ago. In universities, they are less than enthusiastic about computer modeling, practically disregard up-to-date construction and finishing materials, fail to develop management skills. Why you’ve chosen Italy to continue your education? Ekaterina: Italy is a trendsetter in the world of furniture and popular manufacturers of finishing materials, lighting fixtures, accessories, for this country has been intentionally focused on interior design for more than half a century. Economy, education and pursuit of comfort and aesthetics of space inherent to each Italian are tailored to suit design development. Olesya: In Milan, we studied in different universities and met by mere chance at the language courses. With an opportunity of trying to work together, we understood that we complemented each other perfectly: I, as an architect, can embrace volume in general, and Katya is a designer and responsible for details. We have common values and goals, but different areas of responsibility within the framework of one project. This is the story of making our friendly & working tandem. What style do you work in? Ekaterina: Any architect or designer is an artisan painter with its own philosophy and ability to make the same real with a set of tools. We refer to the type of designers having their own specific style. Our clients come to us to seek for it. Classic perimeter finishing, geometry, proportions, symmetry and sober colors are the basics of our projects. In a classic ‘box’, one can easily play various scenarios using only furniture textures and elements of décor. Olesya: We take eclectic style as basis combining English style, colonial details, classic art deco of the 1920s and Provence. Everything that is timeless; interior items which have survived for decades. What things make Arch.Predmet Interior Design Studio specific? Ekaterina: Not all people like our projects. Our customers select us and we opt for our customers, so that we could design and create together. We are not quite a commercial company, for we never work at the expense of healthy human relations and balanced approach to project economy in general. Moreover, we accept far from all offers. We are looking forward to be friends with our clients, so we work for people whose spirits are kindred to ours. This makes our cooperation more efficient and pleasant for both parties. How did you choose premises for your office? Ekaterina: The room completely conforms to our ideas related to the kind of office to locate the designers and architects of similar type and qualification. In the interior, we tried to play on the contrast by using not only antique, but also modern details which resulted in simulation of a classic home interior in designers’ interpretation. What kind of building is your office located in? Olesya: The office is located in the town mansion of the mid-18th century. Its existing décor including abundant and intricate stucco work refers to 1873, when the mansion was restored after the fire. Immediately before us, the space was rented by an Italian who owned a kitchen furniture store, so design was already in the air. As the mansion building is of historical value, we’ve made only minor repairs, painted the walls, wooden doors, window-sills and windows.